Figure 1 - "Healthy Process"
Figure 2 - "Unhealthy Process"
"Gestalt" is a German word for which there is no precise translation. Roughly speaking it refers to a form or configuration. The most common or textbook definition of a gestalt is "a whole which is larger than the sum of its parts." For example, a tree can be thought of as genetically unique from other trees, growing, drawing nourishment, composed of parts (limbs, leaves, roots, cells, etc.) But it is also more than merely the sum of those parts: hypothetically, if one were to somehow uproot the tree, chop it up and lay it in a pile, the parts would still be there but the tree would certainly not. In a similar way, I am myself a whole person, genetically unique and distinct from all others, an autonomous individual, growing, drawing nourishment, with a personality, behavior, body, intellect, feelings, judgements, spirit, dreams, potentials?all of the various interacting and integrated facets of that which I call "my self." More than a mere collection of parts, I am an organismic whole?a living breathing gestalt. The Gestalt approach assumes this. But it also assumes that I am first and foremost an experiencing being. The way I perceive myself, the way I perceive the world, the way I interact with the world?these are aspects of my process of experiencing. This process itself is construed as being cyclical, the closing of a circle, an experiencing of wholes, of gestalten. The satisfaction of hunger is an example of a completed gestalt. When, for example, I eat a plate of spaghetti (which is nourishing and tastes good) I am completing a cycle: I'm hungry; I eat; I'm satisfied?until such time as my hunger reasserts itself. As a complex and unique individual, in a changing and challenging world, my day-to-day interactions are filled with such gestalten. Thus, a more dynamic definition may serve. A gestalt is a completed unit of human experience. It is a unique aesthetic formulation of a whole; it will to some degree involve contact, awareness, attention, and figure formation out of the ground of my experience; it arises out of emergent needs and is mobilized by aggressive energy. "Aggression," in the Gestalt approach, refers to the energy of mobilization; it is directed in some direction. [see figure 1] I am attending, with my attention, to some need, such as hunger. There are many styles of aggression (e.g. "passive-aggression") one or more of which I've learned may satisfy the need, whatever that might be. When I'm hungry, I attend to that need and satisfy it, giving me closure. Once satisfied, I can use my creative energy (aggression) to attend to newly emerging needs. For example, I now need to walk the dog, take a nap, or whatever. The state of closure, or homeostasis, is sometimes referred to as the "creative pre-commitment" stance; my energy is readily available, but not yet invested in any new possibilities. As a new need or curiosity emerges, the cycle begins again. In the Gestalt Approach, awareness is the key to making conscious choices whereby I can be self-empowered, response-able. I can choose, for example, to eat pasta instead of pomegranates, one of which is nourishing, the other of which I'm allergic to. I am not a victim of circumstance. Nor am I necessarily subject to every new whim, desire, or curiosity. With awareness, I can choose to postpone a need?or simply say "no" altogether?with no loss of closure whatever. It might be, for example, that I'm in a meeting I consider very important (I'm attending to that particular need) and deem it inappropriate to rush right out for lunch. Incomplete gestalten will continue to ask for attention until we notice. This asking for attention can occur in many ways, such as through physical discomfort (I might be fidgeting). There are, however, gestalten which are completed without awareness. Particularly in the physical sphere, experiences that occur below the level of consciousness happen constantly. As I sit working, I may develop a cramp in a muscle and move in such a way as to relieve the cramp without even being aware of this process. Sleeping is another example. My body is renewing itself, and on many levels I am reestablishing organismic balance (homeostasis) and closure; on the other hand, my dreams or nightmares might be suggesting "unfinished business," incomplete gestalten asking for my attention. Interruptions, of one kind or another, tend to occur throughout my day. Without awareness, or conscious choice, I may be left with "unfinished business" or unfinished gestalten, needs which have not been attended to or satisfied. I may be left feeling frustrated, uncomfortable, stultified, "blocked." [see figure 2] Without awareness, I might, for example, still be hungry (there's a gnawing in the pit of my stomach which I'm not paying attention to). I have, so to speak, a "condition" which is now coloring the quality of my contact with the world. My perceptual experience is different. My "figure," the "organizing principle" of what I experience, arises from a ground of this "unfinished business" or dissatisfaction. Without awareness, I may be looking for food without quite realizing it; I may adopt a different style of aggression (e.g. manipulating others into feeding me). I may also aggress in a way that guarantees I will not be satisfied. For example, I may drink some coffee, which tends to suppress my appetite. Over time, my unconsciously chosen behaviors may become habituated. I'm not aware of my need; I'm not aware of how to satisfy it; I'm unaware that I'm unaware. As new needs constantly arise, I may choose some neurotic style of aggression which I've come to consider "safe" or "familiar." For example, the clothes dryer breaks down, so I blame my partner who "should" have noticed it. Or, I may aggress in a wrong direction (e.g. kicking the clothes dryer). Neurotic choices might also include drinking alcohol, or watching TV, as a way of avoiding the issue. I'm not attending to the real need in these instances. The "unhealthy" or neurotic experiencing cycle is essentially a creative garbage collector?accumulating and recycling unfinished gestalten. Unfortunately, much of our Western culture has not adapted itself to either stating needs clearly and directly, or to the validation of those needs in the first place: "You can't be hungry, it isn't lunchtime"; "Big boys don't cry"; "You'll never amount to anything, don't pursue your ambitions"; "You're not a loveable person and don't deserve to get quality attention." As a whole, unique and growing individual, I have needs?a variety of forms of nourishment essential to my person and humanity. Because most of us aren't blessed or born with some "absolute awareness," this is necessarily a learning process. At any given moment, I meet the world conditionally; however, I can learn to be aware, just as I may have learned to be unaware. I change by becoming aware of what I do. (We paraphrase Arnold Beisser: Change occurs when I become who I am.) Once I notice my need I can take direct steps to satisfy it, or to accept that a need can't be satisfied at this time. I can make choices based upon reality. I can make direct and clear statements, and healthy quality contact. Copyright? The Gestalt Center of Gainesville, Inc. The on-going, healthy process of living one's life as well as an on-going therapeutic encounter may be experienced as a series of contacts, of awareness of meetings between what is experienced as "me" and that which, in either internal or interpersonal worlds, as "not me." Contact has been described as a "spontaneous concentration" on something (Perls et al, 1951). Such "spontaneous concentrations" may be in awareness or subliminal. I am sitting in a room and someone enters a "not me." If the person enters in such a way that I may see or hear the entrance, I may be aware of my contact; if the person enters quietly I may have some sense of a presence; however, without conscious awareness. As the person enters contactful space, I may become aware that I had sensed the person was there but had not been aware of the presence. For contact to occur, the individual mobilizes "aggressive" energy; that is, the individual actively moves from the closed internal sphere to the contactful sphere, either internal or external, a non-violent contact-function and a healthy one leading the individual to interact with self or the environment in a fruitful way. The mobilization of "aggression" for contact is possible because the individual has an internal "impulse" (Perls et al, p 342) toward health and wholeness. Perls salutes the "courage and creative formative power in every person" (p 288). The impulse mobilizes the creative formative (aggressive) power toward health and wholeness; such power is evidenced in curiosity (see the discussion in Emergent Needs). Healthy contact, then, signals the meeting of two entities; it has the function of enabling interaction between the individual and either an aspect of himself or an aspect of the environment. 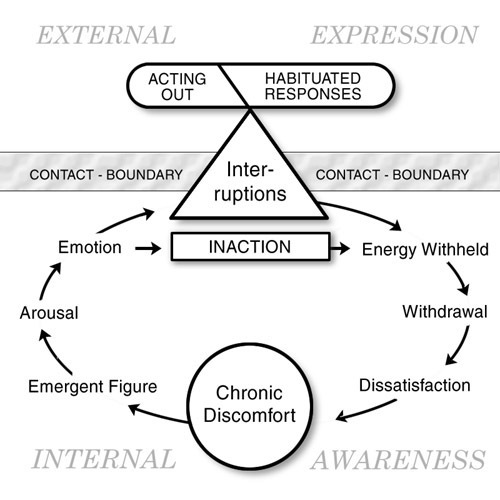 In Gestalt therapy theory, the experience of contact denotes a "boundary," a border; it limits but does not separate. "When we say boundary we think of a boundary between; but the contact-boundary [i.e., the sensitive skin] where experience occurs does not separate the organism and its environment; rather it limits the organism, contains and protects it and at the same time it touches the environment" (Perls et al, p 229). The healthy contact-boundary defines the organism (the human person) and at the same time enables growth and change through the interpenetration with that which is novel, nutritive, supportive or challenging, unknown until the moment of contact. Many mechanisms may signal ill health, blocking what Miriam Polster has called "good-quality" contacting, the kind I have been describing. In essence, ill health is defined in Gestalt therapy theory as the absence of aliveness, novelty, interest, or challenge in a client's experience because of perceptual and conceptual screens that block out that which is unknown and therefore fearful. The neurotic erects a system that is conceived because it helps him/her in feeling safe or in control; it defines change as being too risky. Essentially, the neurotic deals with a self-limited, self-defined world. At some time in the past there was a good reason for erecting barriers around the self; however, although that reason may have disappeared, the belief system of that neurotic individual maintains the self and the world as if nothing had changed. For example, a client discovers that her basic belief about herself is as if she is an unlovable child. As a child in her experienced world that seemed true. At 54, that belief is outmoded but it is there in her habituated patterns of self definition and has a tenacious hold. In speaking of "the Neurotic" I am including all of the classic ways of being neurotic that Shapiro (1965) has noted as "neurotic styles": narcissistic, obsessive-compulsive, manic-depressive, paranoid, hysteric, anxious, depressive; and also behavioral labels that have been added since Shapiro's book appeared: addictive, borderline, phobic, post-traumatic stress disorder, psycho-somatic disorder, disorders of aspects of the self. For most practicing therapists a label that denotes severe pathology such as schizophrenia is not useful. However, Gestalt therapists who work in hospital settings use such sets of symptoms because they work with such patients. Symptoms of neurotic disorders are presented in each client who opts into therapy; each Gestalt therapist may observe such symptoms and may conceptualize a diagnosis such as any of those just mentioned. However, Gestalt therapists do not endeavor to discover causes; we use diagnostic concepts to organize the vast amount of information into meaningful units, as Melnich and Nevis (1992) have noted. And we do not treat "neurosis"; we treat persons who demonstrate various ways of blocking themselves from healthy functioning, from easy and effective gestalt formation and completion, from a sense of the self as "okay." Melnich and Nevis have developed a system for description of the various neurotic or psychotic structures in terms of blockage at significant points in the gestalt formation and completion cycle. Such a system, although helpful in many ways, does not address itself to "disorders of the self" (a destructive top dog/underdog process for example) or of the self concept. Labeling such neurotic or psychotic structures may enable me as a Gestalt therapist to discuss clients with other therapists and may lead me to use certain interventions instead of others, if I lack inner direction; however, no label must contaminate contactful presence with each client in the moment-by-moment interactions. The neurotic person may block good-quality contact in ways that seem to protect the self, while actually in many cases (i.e. retroflection) being harmful. I shall list some of the classic types of blockage here with brief examples; you will find excellent discussions in such books as Gestalt Therapy Integrated (Polster and Polster, 1971). The original list is in Perls et al, 1951. Projection: I attribute to others thoughts, feelings or meanings which are products of my own imagination. Example: I observe a person being quiet and believe them to be angry. Introjection: I have "swallowed whole" a message from others without questioning its validity. Example: I believe that I am stupid because my father always said I was. Confluence: I am not aware of myself as a separate, distinct or autonomous individual. Example #1: An infant's sense of self awareness in the parent-child relationship. Example #2: Perhaps a powerful sexual, romantic, or mystical experience. Deflection: I do not respond directly to contactful possibilities; I change the focus. Example: To the question "How are you?" I might respond with "Well, that's a good question." Egotism: I am so concerned with myself that I do not recognize genuinely contactful opportunities. Example: I am asked for my opinion, and I take this as an obvious sign of the other person's inferiority and weakness. There are examples here which are not necessarily neurotic. The crucial factor is awareness: I am conscious of what I am doing, making contact choices knowingly, not simply out of habit, in response to unique, present, and changing circumstances. All therapy is change-oriented. What changes are the goals for the Gestalt therapist? The classic description of the goal is the general statement of Fritz Perls? "What we are after is the maturation of the person . . . to help him make the transition from environmental support to self support." In other words, the major targeted movement is from neurotic manipulation of self and environment for satisfaction of needs to "good quality contact" (again, Miriam Polster's term) from a fully functioning self with that self's environment. The dimensions or components of "good quality contact" cannot be stated categorically because, since we honor the uniqueness of each individual, such contact may vary considerably between individuals and in each individual at different times. For example, if I attend a lecture my good quality contact may consist of listening carefully and taking notes; at a cocktail party good quality contact may mean glancing around, greeting a few people or it may mean plunging into an animated conversation about some political or environmental concern. In a one-to-one situation good quality contact may be significantly different?personal contact, eye contact, physical contact, more silence, fewer words, etc; it might mean speaking my truth to someone who doesn't want to hear. Good quality contact means aggressing into the environment in ways that satisfy my needs at any particular moment. Good quality contact also necessitates some modifications of language systems. Clients come from very different cultural backgrounds and a therapist must be able to accommodate his/her language patterns to those of the client at least to some extent. How each individual makes the change from self- and environmental-manipulation to self-structured and self-supported good-quality contact is the business of Gestalt therapy. Gestalt therapy is process-oriented. This separates Gestalt therapy from any form of therapy that contains or is founded upon sets of constructs about human behavior that are believed to apply to all persons in prescribed experiences. Rather than trying to fit a person into a category, the Gestalt therapist focuses with respect upon the uniqueness of each individual. As the therapist pays attention to the stories or reports of events that a client shares, the focus is not only on the report but also on the lively signals that indicate underlying material of which the client may not be aware ? how the client is experiencing him/herself in his/her world in the present moment. Process may be signaled in both verbal and non-verbal behavior, often primarily in the non-verbal sphere, in "metacommunication," as George I. Brown has stated (1987). These signals indicate the client's contact or lack of contact with that which is meaningful. In another context, the signals of underlying process in verbal and non-verbal behavior indicate different things in different spheres. In the internal (intrapersonal) sphere, such signals indicate the unique individual's on-going formation of, or interference with, gestalt formation and completion. In the external (interpersonal) sphere, such signals indicate the contact or interference with contact between individual and environment. The signals of process are the focus for the Gestalt therapist. 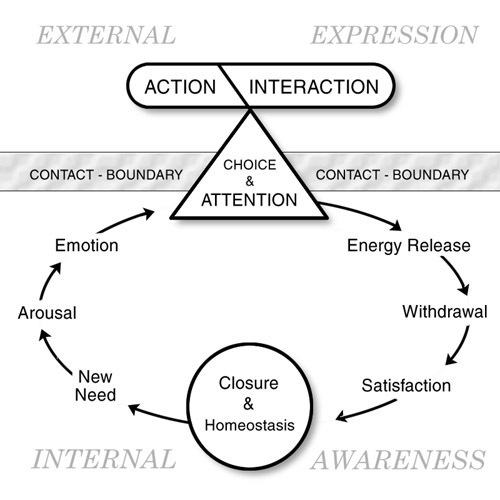 "Awareness is characterized by contact, by sensing, by excitement and by gestalt formation" (Perls et al, 1951, p viii); "[It] is the spontaneous sensing of what arises in you of what you are doing, feeling, planning" (p 75). In the example given in Contact: Good & Ill-health, I may have sensed the entrance of the person into my room but until I am aware, the excitement is missing and there is no gestalt. When I do make good-quality, aware contact with the person, I feel excitement and that experience is a gestalt. "Gestalt formation always accompanies awareness" (Perls et al, 1951, p ix). awareness of one's personal truth, one's personal beliefs and values as experienced in what Edward W. L. Smith has called "the inner voice which speaks the wisdom of the organism" (1992, p 100). Early reactions to Gestalt therapy theory interpreted the theory as "anti-intellectual" usually associated with Perls' dictum loosely translated as "Get out of your head and into your senses." The emphasis on the wholeness of the organism was lost, as was the fact that all awarenesses are mediated through the mind. Actually the distinctions between cognitions and the cognitive process were not always made clear. To speak of thoughts, memories, daydreams or plans is to focus on elements within a cognitive structure; to construe the world on the basis of such structures may be stultifying. However, if the individual is aware of the structures, the awareness itself is the organizing principle and thoughts are transformed into the process of thinking; memories may become the process of remembering; daydreams may become daydreaming; or plans, planning. Perls distinguished between a stultifying intellectualism and a lively intelligent awareness; such a distinction seemed too subtle to persons who were not Gestalt oriented. Awareness and attention are terms often used interchangeably; however, in Gestalt therapy theory they are not synonymous. "Attention is consciously effortful, but awareness is not" (Korb et al, p 8). The use of the word attention signals a purposive focus, made intentional by choosing the cognitive direction of perception toward a particular target; the target may be chosen from either a neurotic or health-oriented perspective. Attention is based on awareness. Awareness on the other hand does not involve the focused energy of attention. A lively intelligent awareness (at whatever level of intelligence or whatever kind, conscious or not,) is an on-going aspect of being human, surviving in a not-always-supportive world. At the survival level awareness is not necessarily conscious; it can be sensory awareness based on sensory intelligence, sensory knowing. At other times the person may be conscious but unaware, almost sleepwalking. If I am walking through a wood on a lovely spring day I may be sleepwalking, conscious, but unaware of my self or my surroundings. If all at once I hear a rustling in the brush beside the path I may react from my sensory awareness (being) and turn and run. Sensory awareness may burst into consciousness in an intuitive experience; the antecedent information from awareness has not been conscious. When I stop running I may become consciously aware of what has happened. In the example used earlier to illustrate contact, the entrance of the person has been recorded by my sensory but not conscious awareness (subliminal contact). When the person moves into contactful space in which I can see or hear, my awareness becomes conscious. If I make aware contact with the person entering my room and feel joyous, anxious or insecure I may choose to pay direct attention to that person in order to discover what stirred my feeling. In that case the focus for my attention is forcibly directed; I may learn that the person is a dear friend or that he/she is glowering at me and a further encounter is necessary. In another context, using another set of verbal signals in Gestalt therapy, that which is the focus for my attention is noted as the "figure," that is, the material that emerges from the "ground," that is, the rest of my life experience. The individual perceives the environment as a total unit; he/she responds to the whole of what is seen and this whole is composed of the stimuli of which the person is aware or to which he/she attends, the "spontaneous concentration" of contact (the figure) and those of which the person is not aware or does not attend (the ground). The figure/ground process is perceptual and changes momentarily. Study, for example, the classic Gestalt perceptual picture at right. Two persons can be perceived, an old woman and a young woman. When the old woman is figural all the rest of the picture is ground; when the young woman is figural the old woman disappears into the ground. As you study the picture you may be able to change your perceptions from one figure to the other in order to appreciate the process of emerging figures and receding grounds as it occurs in your everyday life. To arbitrarily change one's focus is an experiment in perception. However, in a life situation such a change in perceptual focus represents more than a trick of the eye. The perception of a figure emerging from the ground is a consequence of an internal choice that, although momentary, involves a complex of internal processes. In the internal world, personal needs, values, beliefs, etc. provide the impetus for the choice of figure; the choice also is powered by the search for meaning, a search that is endemic in each human being. In Gestalt theory, the meaning connected with a figure is a critical aspect of its relation to the ground at that moment. Thus, if at the first look at the above illustration you perceive the young woman, your choice of that perceptional target may relate to some personal experience, favorable or difficult, with young women or some negative experience with old women. These relationships have been accumulated in the ground of your experience; for you, the meaning of the figural young woman is derived from the connections you have had with women. Some similar analysis could be made if you perceive the old woman first. Whether the viewer notices the old or the young is related meaningfully to the ground of the viewer's experience which is a rich mix of all of the past experiences of the self, the world, and their myriad interactions plus the feelings, beliefs, values and the needs that are embedded in the internal world. The ground defines the figure and gives it meaning. To change the figure, whether in awareness or not, involves a complex set of internal changes. These are always in process. I sit at my desk as I write; at one moment I am aware of thinking, at the next of the feel of the pen in my hand, at the next of seeing a set of papers that remind me of other tasks I need to perform, and again I am aware of thinking about this material on figure and ground. On the unaware level in my body the figures have been relating to my internal processes and at once I am aware of being hungry. The context changes to choices about actions. Such perceptual changes are a potent aspect of any therapeutic interaction as well. The client's figural process must be followed and the therapist's figural process must be honored also. The art of Gestalt therapy comes into play with this scene in which the therapist must attend to both the client's figural process and to his or her own. Alternative illustrations of figure/ground relationships may be seen in the classic Gestalt "Vase/Faces" picture on the left, or from this example offered in the Korb et al 1989 book: as you read this material note that the margins and spaces between letters and pictures on the printed pages help to define the words, sentences and pictures. If there were no margins and spaces it would be difficult to distinguish what has been written. Although the white margins are blank spaces they do not have blank functions?they are integral to the perceptions of the words. Likewise, all figural information, whether visual, physical, semantic, emotional, or interpersonal, is gained by relating a figure meaningfully to the field of impressions against which it is perceived, the ground. In the description of awareness and attention we look at the process of awareness and the structures and processes of attention. What is figural for an individual is conceived in Gestalt therapy theory as related to organismic need?the satisfaction of basic survival needs as well as the need for wholeness. Need is related to "impulse" toward health and wholeness and the aggressive energy necessary for the impulse to surface. Here Maslow's hierarchy of needs may add to our formulations. At the survival level, the "active organizing force of meaningful wholes relates to physical, emotional, mental or social survival" (Perls 1973, p 3). Need reduction is reactive in the context of the organism/environment field in which survival is the key. However, when we consider other levels of need as in Maslow's community needs and self-actualizing needs, (Perls notes these as a need to "grow" [1973, p 7],) some mechanism other than need reduction seems to be operative. Here Michael Vincent Miller (1987) suggests the addition of curiosity. He suggests that curiosity "is itself a primary force linking the evolving infant [person] to its environment and playing a central part in deepening and enriching this relationship" (p 25). Survival needs and discovery needs are intimately related. The need for safety and security is paramount in the presence of threat to any of the survival needs?food, clothing, shelter, touch, etc., in the physical sphere or care and validation in the mental/emotional/social sphere. However, when safety and security are assured, the need for novelty, experimentation, and discovery emerges. Here curiosity is the "elemental shaping force" (Miller's words) and we may note that imagination functions as one of the elements since efforts to actualize oneself are creative efforts. The individual is moving into the unknown using "aggressive" energy. To conclude, then, imaginative curiosity takes over when the individual feels safe and secure, when there is no need to fear for survival in any context?physical, mental, emotional, or social. In an infant's behavior this connection is easily demonstrated: Watch a baby who does not feel safe or, alternatively, who can be observed exploring a crib or a toy or a face. Even a baby's curiosity reaches out to understand the world around it and to "know it for what it is" (Miller's words). Adults have learned to be less transparent about their needs but the same kinds of connections can be observed. Miller again: "Treated as a fundamental theoretical concept, curiosity fits readily into the phenomenological basis of Gestalt therapy, for it is an 'intentional' concept; that is, it combines awareness with aggression in the sense that Gestalt therapy uses these terms, reflecting the subjective experience of a self directing its meanings and purposes toward the world" (p 22). Perls seems to have had this process in mind when he spoke of "interest" as the organizing element in the emergence of needs (Perls 1973, p 2). Curiosity or interest, then, is proactive, that is, open to or directing itself to new experience; need reduction is reactive, that is, it rests on awarenesses of survival needs. Both are necessary when describing the organism/environment interactive processes. In either case, needs arise, come to the foreground and recede progressively as they receive attention and are satisfied. As has been noted in the Korb et al 1989 book, this continuous perceptual process has been expanded by phenomenological psychologists as a model of general human functioning (Combs, Richards, and Richards, 1975). Once satisfied (the gestalt completed), a need recedes from prominence and another emerges into awareness. Figure 1 ? "Healthy Process"
When I say that I believe each person is the "expert" in his/her own life, that in Gestalt therapy I as the therapist provide the safe /supportive /challenging context for that "expert" to emerge with insights and realizations, I am pointing to the unblocking of creativity in both the client and the therapist. It is essential at the outset to understand that creative energy has not been dormant or somehow absent, but actively engaging in other processes: neurotic mechanisms, habituation, attitudes, assumptions, and belief structures. Hence, when I say that creative energy is released, I am implicating a vast potential reservoir of unreleased activity and creative processes. In the discussion concerning contact, I do not differentiate "good" contact as more or less creative than "bad", healthy versus unhealthy, or positive versus negative. I am addressing the "creative formative power in every person" (Perls et al, p 288). The neurotic erects a system that is conceived because it helps him/her in feeling safe or in control. This does not negate that there might have once been reasons, or even currently are valid reasons, for constructing such a system. Nor does it negate the creative energies involved in perpetuating it, as there are definite results and conditions as a consequence. In the gestalt formation and completion cycle, the "A-ha" may be the momentary figure; however, it arises from a ground of constantly (re-)creative activity. Since many such processes are unconscious (I include dreaming as an example) there is no reason to imply a necessity of the "will" or deliberate action. By limiting my view of what is "acceptably creative" to merely conscious and willful activities, I deny the areas of chance, growth, serendipity and surprise. What could be more creative than play? more stifling than self-consciousness? more stultifying than being "all-knowing"? or more controlling than learned-helplessness? Gestalt therapy is not a forensic science. I do not present myself in a doctor-patient role, the powerful "curing" the powerless, or presuming that I know what these processes are. Much of typically Western culture is based upon achieving personal (creative) legitimacy via some higher power, an external authority figure, social ladder, commodity acquisition, or socially sanctioned skill set. Although these may be valid pursuits, they tend to disenfranchise the aliveness, spontaneity, curiosity and visceral creativity which is present moment-by-moment to every child. From a holistic Gestalt perspective, creativity is not the province of "the Arts", artists, or any select stratum of society or discipline. Nor is it an achievement. It must ultimately be embraced as a birthright and an existential constant; whether we learn to use it consciously, responsibly, and proactively or not. The active word is awareness. It is the intrinsic role of the Gestalt therapist to provide the appropriate environment which invites the client to become the "expert", the "author" of his or her own unique and individual legitimacy, a self-empowered co-creator of a work in process. Figure 2 ? "Unhealthy Process"
In Gestalt therapy the model of an individual is always of that individual in his/her environment or "field" or "life space" (Lewin 1951). Thus, the focus of therapy is a complex of material from the individual, from the environment, and from the interactive processes between. Out of that complex of material, the therapeutic focus is the figure that the client presents, keeping in mind the multiplicity of factors that are related to that figure. Furthermore, according to Lewin, "behavior depends neither on the past nor on the future but on the present field which has a certain time-depth. It includes the 'psychological past,' 'psychological present,' and 'psychological future' which constitute one of the dimensions of the life space existing at a given time." The "present field" is the "here and now" of the Gestalt therapy dictum. And the complex of material about the individual and his/her life space at any given moment is dealt with as in Lewin's theses, as "mutually dependent upon each other," actually as one field. In this sense an individual is not the sole arbiter of his/her world; the world is co-created. Although only the individual is present in the therapy session, the material presented is his/her construction out of his/her perceptions, assumptions and beliefs but not his/her sole creation. The data for those perceptions, assumptions and beliefs come from the life space. Furthermore, it does not matter what figure emerges to be the focus for therapy or personal work. The whole of the individual and the individual's life space is attached to that figure. Whatever is necessary for closure of gestalten will emerge.